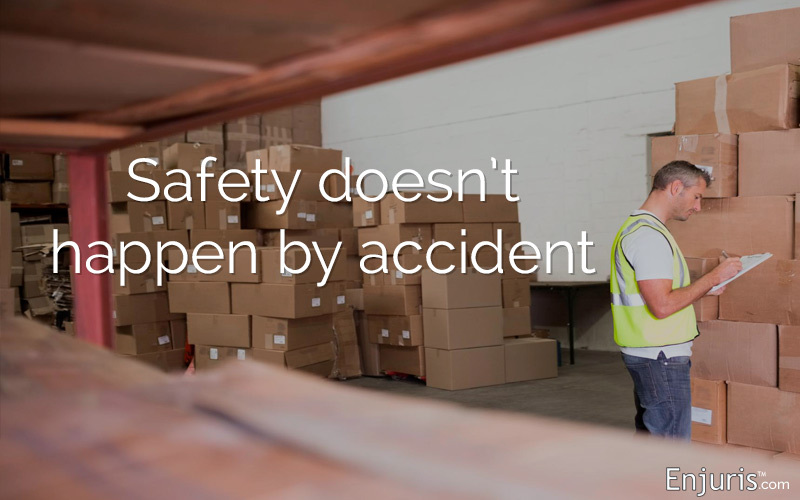 Considering all the safety technology advancements made available in recent decades, you might think that warehouse accident and injuries have significantly reduced. Even though automation technology has played a major role in reducing manufacturing injuries (by reducing the need for workers), a warehouse is still useless without at least some human employees. And keeping these employees safe is one of the most important responsibilities of those in charge at a manufacturing facility. Warehouse workers often carry out various tasks such as assembling items, loading trucks, labeling items, controlling inventory, breaking bulk materials, arranging transportation, and packaging orders. These workers are exposed to serious risks that could be life changing. If you’ve worked in a warehouse, then you can easily relate to this. If you haven’t, you still can imagine what would happen if the unexpected occurs while loading a truck or when breaking materials. At Enjuris, we believe all workplace injuries should be taken seriously. Slip and fall accidents are the main causes of warehouse injuries. While rare, some slip and falls are fatal or lead to permanent body transformation. Many more lead to broken limbs. Some employees are required to climb ladders while others work at frightening heights. In addition, some slick warehouse surfaces may cause employees to easily slip or trip. Other notable hazards include dark areas that aren’t properly lit, liquid spills, and loose materials. Falling objects are another major concern. There are often heavy boxes or other items stacked on shelves in warehouses. A slight slip may cause objects to fall. If something heavy falls on you, it can severely injure you or worse. Many warehouses contain flammable liquids or gases that can quickly become explosive if ignited. Exposed electric wires are a major source of these fires and explosions. Without proper ventilation, fires in warehouses spread quickly. If there’s no emergency exit nearby, the worst could happen. Workers and employers should be mindful of such risks. Hazardous materials are also commonly found in warehouses. For instance, many old warehouses contain asbestos. Some chemicals, such as acids and other toxins, are stored in warehouses. In the event of a spill, the lives and health of workers can be endangered. Acid burns lead to permanent body transformation, and prolonged toxic exposure can result in an occupational illness or disease like cancer. People working in the manufacturing sector often subject their bodies to intense stress. Injuries often occur when a person tries to lift an object that’s heavier than what their body can handle at that moment. Overexertion can also be caused by lowering, carrying, pulling, and pushing heavy objects. The shoulders, neck and the back are especially vulnerable to such stress. Overexertion may lead to broken body parts or chronic pain. Racking guards should be installed to reduce falls. Protection beams, upright column guards, and bollard posts also serve this purpose quite well. Proper education and training of warehouse employees shouldn’t be overlooked. Workers should undergo a comprehensive education program where they’re taught how to safely use machines, correct posture, lifting techniques, and load characteristics. Workers should be trained on proper fork lifting techniques to reduce accidents in receiving areas. Untrained forklift operators can easily cause accidents in places that are surrounded by boxes and pallets. Workers should also be trained on how to identify, handle and store harmful chemicals. Floor marking is a simple task that can play a great role in reducing workplace injuries. In addition to helping organizing a warehouse, floor marking enables workers to take note of risky places. Warning signs should be clearly marked and properly installed to prevent accessing harmful materials and caution workers about other hazards. For a real life example of how a warehouse accident can impact your life, look no further than Vickie Shannon Allen. Vickie, age 49, started working at an Amazon warehouse in Haslet, Texas. Initially, she was excited by the fact that she was working for a globally recognized corporation. However, after a few months, she felt completely different about her working conditions. According to Vicky, her station was reportedly missing a piece of safety equipment designed to stop items from falling onto the floor. She injured her back when she tried to use a tote bin to count items while in an awkward position as a temporary replacement for the malfunctioning safety equipment. This went on for about three weeks. Vicky said that she tried to work in the same condition for three weeks without compensation. Finally, she admitted that she could no longer work at the warehouse due to worsened health conditions. Amazon offered her a $3,500 buyout not to say anything negative about the company publically, which she declined. Now, Vicky is now homeless and lives out of her car. She no longer works at Amazon. “I can’t believe this is my life now … I work for the world’s richest man and I live in my car,” she said in one of her recent YouTube videos documenting her story. As Vicky’s story illustrates, clearly warehouse safety and preventing manufacturing injuries is important. Avoiding these workplace accidents in the first place should be the main goal. But if you or a loved one are injured in workplace accident, like Vicky, consider contacting a work injury lawyer near you to learn about your legal options.